Blade length : 66.7 cm or 26.3 inches. Sori :2.272cm or 0.89 inches. Width at the hamachi : 2,9cm or 1.14 inches. Width at the Kissaki : 1.78cm or 0.7 inches. Kasane : 0.58cm or 0.23inches. Era : Late Edo period, arund Ansei Era. and has a nice shape. Kasane is a little bit thicker, Kissaki is a bit long. Sori is deep. Jigane : Koitame-Hada is grained well which looks Muji. it has Jinie attached. Hamon : Niedeki, Choji-midare mixed with Kikka-Choji. it has distinct Nioikuchi. Boshi is Midarekomi. then his style is the same to Sukekane. considering that, Sukehisa must made for his teacher. Tsuba : Oval iron Tsuba, it has the Kasa hat deign. signature reads Buko ju Yoshiyuki. Menuki : Copper Menuki, it has the Tokko design. 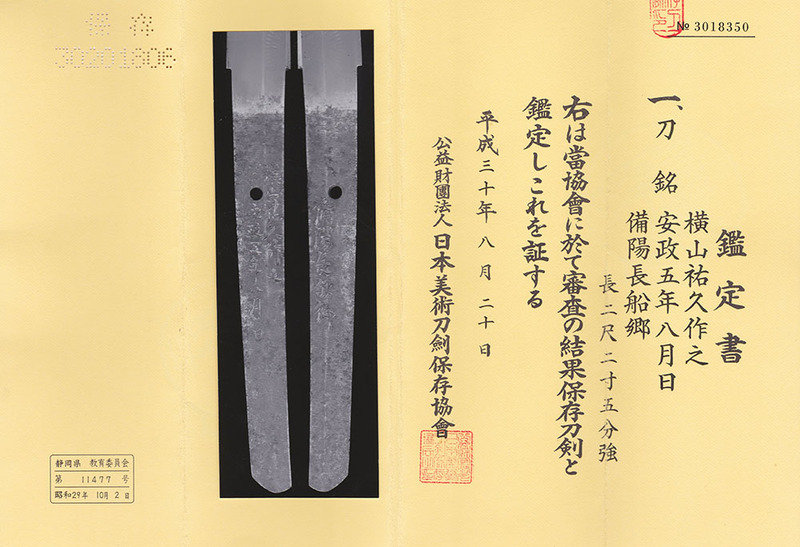 From Aoi Art : This sword is made by Sukehisa from Yokoyama school at the late Edo period. The school's Kikka-Choji Hamon has a sense of elegance and is highly recognized. The price is relatively reasonable for a Shinshinto with Koshirae.